As Banned Books Week winds to a close, I wanted to highlight a frequently challenged novel for this edition of Retro Fridays. It was hard to choose which one to talk about, as there are so many among the oft-challenged books that I love and remember fondly from my childhood or teenage years. 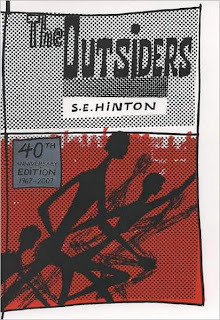 I finally chose The Outsiders because of the particular reasons it's been challenged and because, when I read it for the first time I was a teen myself, just a little bit younger than Ponyboy and Johnny. This book had a huge impact on me at that age. I fell so deeply in love with Hinton's simple, vivid writing style. Never had teenagers like me felt so real and present on the page. I couldn't stop telling my mom about it and how good it was and why. I'm sure she still remembers those nights. And thinking about it now, I would have been devastated if someone had told me I couldn't read it or had come and taken it out of my library. I can't imagine not having read it then and I have read it so many times since. It's truly a classic and deserves the praise it's gotten over the years. I picked a small, worn copy of The Outsiders up off the shelf of a tiny used bookstore in Texas and took it home with me because I felt like the kids on the cover might be worth knowing. How right I was. This story of small-town prejudice and class warfare set in the 1960s has never really aged. The first time I cracked it open I was immediately enchanted by the magical language these kids seemed to speak, a language full of "greasers" and "Socs," "savvys" and "tuffs." I couldn't tear my eyes away. It is a coming of age story and a commentary on the dangers of going through life with blinders on, of judging people who are different from you before you know them. Of not wanting or caring to know them. Every character in this story is backed up against the wall, struggling to survive, and I cried more than once at the injustice of it all. And yet, when you come to the end, you feel the indomitableness of hope, the possibility of change, and the beauty of the human spirit. 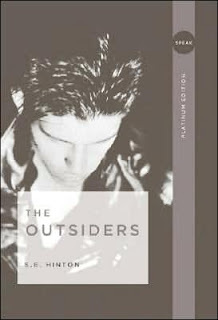 The Outsiders has been challenged several times on the grounds that it includes rough language, violence, references to cigarettes, alcohol, and for depicting broken families. And we would never want young adults to know that such things exist or, heaven forbid, that they may encounter them in their own lives. *eye roll* I get so angry when I hear hogwash like that. Never mind that it's beautiful, and real, and good. That it will teach its readers about how to treat their fellow human beings, how hatred and fear do nothing but destroy, and how the sunset looks the same no matter which side of the tracks you're from. That's the kind of book I want to read. That's the kind of book I want my children to read. And no one is allowed to tell me no. Raspberry, I know! I thought about posting a pic of the cast. What a bunch of kids who went on to be so famous. I love the movie. It is definitely one of my very favorite adaptations of a novel. I love the movie too. Great book and great film. I wish I owned the extended edition of the movie, but I'll get it at some point. I loved this..." and how the sunset looks the same no matter which side of the tracks you're from." Great part in the book and so very true. Hey Angie. Nice to meet you. Can't wait for Oct. 15! I just bought this the other day due to you mentioning it previously. I've the massive new Diana Gabaldon to read first, but this is definitely on the top of my TBR list! I'm happy to say this book is still a favorite. Right around the 6th grade I'll start recommending it to kids (both boys and girls) who then tell other kids about it and ask for other books by S.E. Hinton as well. No wonder it's still in print. Lauren, I want the extended edition as well. One more for the wishlist, I guess. Sami, hey, nice to see you round these parts. I'm looking forward to it! Sarah, yep, that's right when I read it--6/7th grade. And it is such a great one for boys and girls, as you said. I'm happy to hear it's still out there getting action. I read this at about 13 in my English class. Great memories! ahh i remember the outsiders...read it for seventh grade two years ago. now i try to read it at least once a year. I was so moved by your review!! I remember my reading experiences of this story quite vividly, too. I remember crying at the climactic end -- S.E. Hinton's writing really connects you with her characters, and seriously takes you to the opposite poles of emotion. Have you see an adaptation of it? I couldn't stop being amazed that she wrote this at 16. This was an AMAZING book. I love this post. 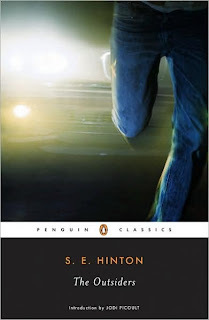 The Outsiders was another of my favorite books as a teen - I must have reread this a gazillion times. I was so in love with Ponyboy. And it is such a beautiful story, as you said, about what's real, and good. Oh my god, The Outsiders. This book blew me away when I was a teen. I remember glomming onto S.E. Hinton and reading every book of hers in my school library: That Was Then, This Is Now, Rumblefish, Tex. I watched the movie much later. It was good, but the book was better. Oh, I used to ADORE the Outsiders. Mostly the movie though. I need to pick it up again. Also just gave you an award here. I'm totally going to reread my copy! Thanks for reminding me. Lenore, yep, just about the age I was. Dannie, what a great tradition! I have some books I do that with and it's always an experience I look forward to. Sharry, it's a tear-worthy book. That's all there is to it. The writing was some of the sparest I'd read at that age and I just loved it. It was refreshing and felt like it wasn't trying to pull something over on me or talk down to me. I have seen the Francis Ford Coppola film and it is excellent. Janssen, it still boggles my mind. Janice, I did the same thing! I blew through her entire bibliography. I remember being quite fond of THAT WAS THEN, THIS IS NOW. Melissa Walker, you are welcome. Enjoy the reread! I believe you already know how much my teen LOVES The Outsiders. She now has a whole S.E. Hinton section on her bookshelf now... which includes The Outsiders movie dvd. Christine, a Hinton shelf! That's a true fan. It's hard not to blow through her backlog once you really fall in love with THE OUTSIDERS. I still smile at your daughter's awesome shirt. I read this one for school so I didn't really enjoy it. It was to back country for me. Although it was well written.